Sunday November 7th 1897 We did not get through the work in time to go to church but went up home for dinner. Had a very pleasant stay came home early to do chores as it looked like rain. 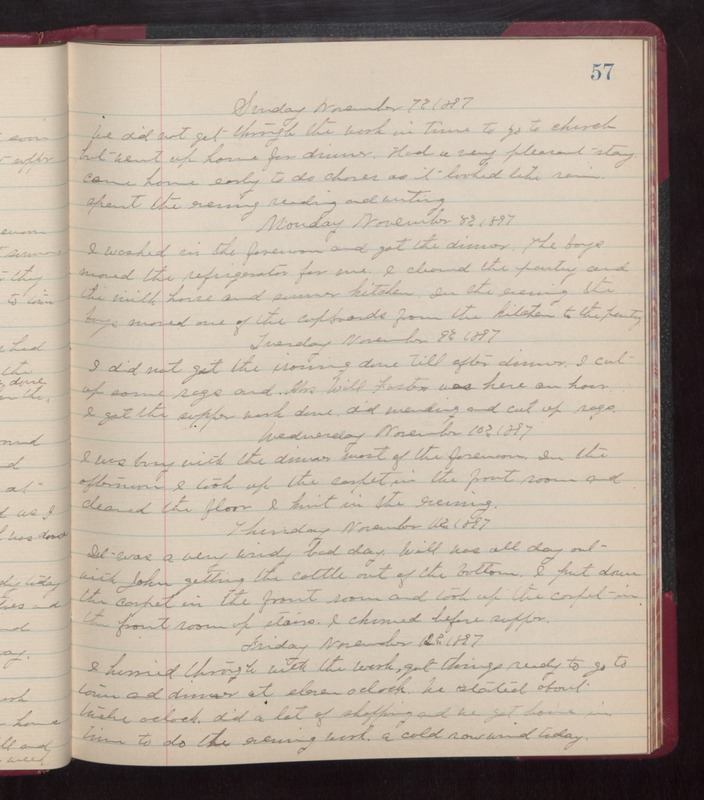 Monday November 8th 1897 I washed in the forenoon and got the dinner. The boys moved the refrigerator for me. I cleaned the pantry and the milk house and summer kitchen. In the evening the boys moved one of the cupboards from the kitchen to the pantry. Tuesday November 9th 1897 I did not get the ironing done till after dinner. I cut up some rags and Mrs Will Foster was here an hour. I got the supper work done, did mending, and cut up rags. Wednesday November 10th 1897 I was busy with the dinner most of the forenoon. In the afternoon I took up the carpet in the front room and cleaned the floor. I knit in the evening. Thursday November 11th 1897 It was a very windy bad day. Will was all day out with John getting the cattle out of the bottom. I put down the carpet in the front room and took up the carpet in the front room up stairs. I churned before supper. Friday November 12th 1897 I hurried through with the work, got things ready to go to town and dinner at eleven oclock. We started about twelve oclock, did a lot of shopping and we got home in time to do the evening work. a cold raw wind today.